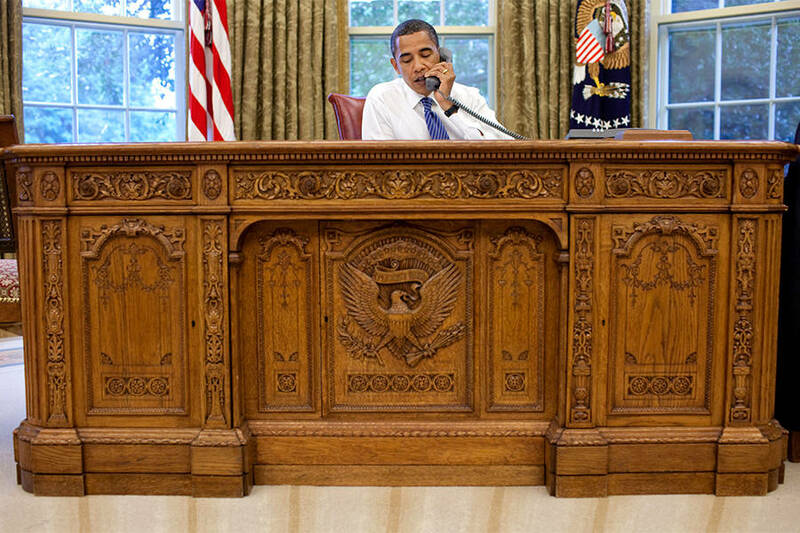 The Resolute Desk was a peace offering gift from Queen Victoria, but that's just the tip of the iceberg. Wikimedia CommonsPresident Barack Obama sitting at the Resolute Desk. When Jacqueline Kennedy moved into the White House, she immediately dove into a renovation project, hoping to restore the White House to its former glory. Since its construction, the building had been ravaged by several presidential debacles, and at least one fire. She hoped to bring new life to the place while honoring the American traditions it held. As part of her quest, Jackie began to search for new furniture for the West Wing to do away with the stuffiness of the offices and make the presidency seem more casual and accessible. While looking for furniture, Jackie came across a desk, hidden away in the basement of the West Wing, covered in tarps and dust. The desk that Jacqueline Kennedy found, known as the Resolute Desk, is one of the most fascinating pieces of presidential history and one that’s often overlooked. When she placed it in JFK’s Oval Office, she was continuing a tradition that had been long-standing for almost a century, and one that would continue for years to come. 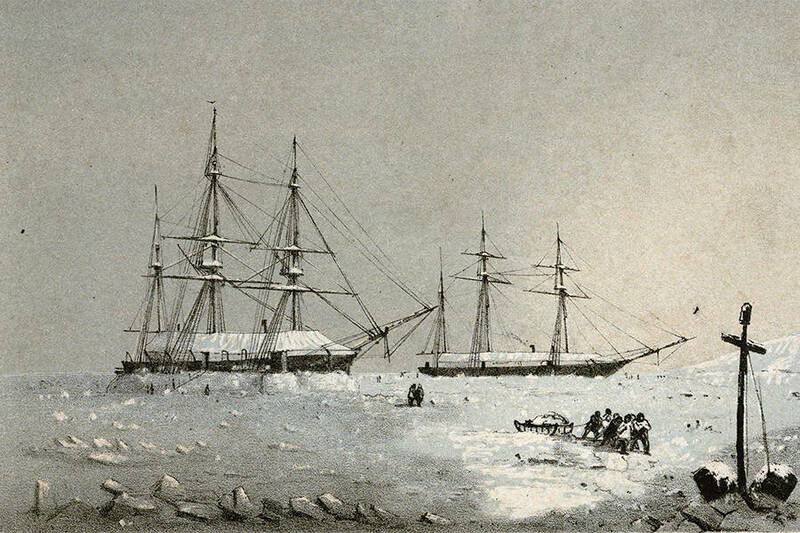 Wikimedia CommonsA painting of the HMS Resolute trapped in the ice before its rescue. In 1880, Queen Victoria commissioned the desk as a gift for U.S. President Rutherford B. Hayes, but the history extends far beyond that. The desk is named for the vessel from which its wood comes, a British Royal Navy ship known as the HMS Resolute, which had been designed for Arctic exploration. In the early 19th century, the Arctic was a vast wasteland of unexplored territory, one that only the bravest (in the most decked out ships) attempted to tackle. One of those brave men was Sir John Franklin. In 1845, Franklin set out to explore the Arctic but vanished mysteriously. The Resolute set out seven years later to look for the lost expedition, but ultimately ended up hopelessly trapped in the ice. In 1855, an American whaler named James Buddington on the George Henry discovered the Resolute and extricated her from the ice, carefully sailing her back to the Brooklyn Navy Yard in New York. Over the next year, the ship was refurbished and made seaworthy again, before being sailed back to Britain as a peace offering for the Queen. Great Britain and America had been in a territorial dispute over several pieces of land, and President Rutherford B. Hayes hoped the safe return of one of her Majesty’s ships would help smooth the tensions. Indeed, upon receiving her gift, Queen Victoria expressed her gratitude, and carefully guarded the ship for the duration of its life. 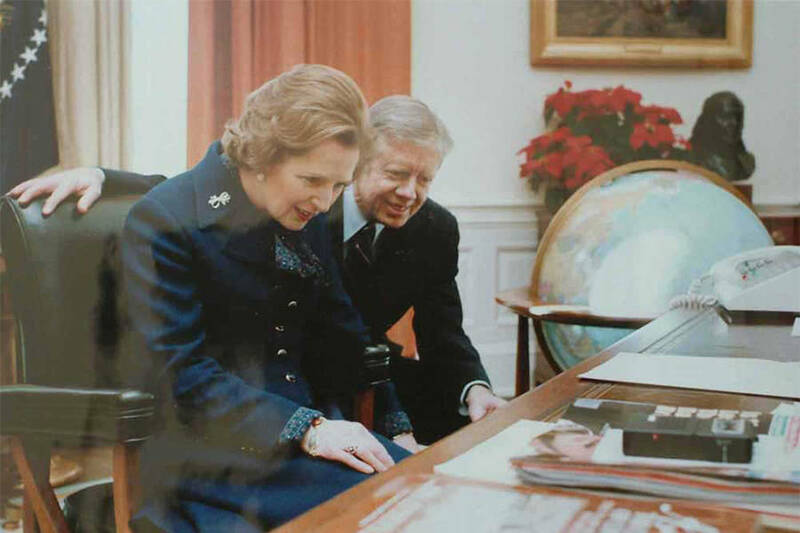 Wikimedia CommonsBritish Prime Minister Margaret Thatcher admires the Resolute Desk, after President Jimmy Carter returned it to the Oval Office. In 1879, the Resolute was deemed no longer fit for sea travel. Wanting to continue to honor the ship’s role in smoothing tensions between the two nations, Queen Victoria had the ship turned into three desks. The largest would be sent to President Hayes in America, and the other two, both smaller writing desks, would remain behind as twin Resolute Desks to symbolize the familial relationship between the countries. Upon receiving the gift of the Resolute Desk, President Hayes placed it in the president’s private office, where it remained for several generations of Commanders in Chief. At the time, the Oval Office, which was a much different room than we know it today, had no desk and would continue to be desk-less until Theodore Roosevelt insisted upon having one. Though this “Roosevelt Desk” held the place of honor in the Oval Office for several presidents, the Resolute Desk remained in the private study where Hayes placed it. Every president from Hayes until Kennedy would sit at the Resolute Desk in that study. Eisenhower was the one who moved the desk to the ground floor and later to the basement. He opted to use it during broadcasts that were sent out from the Broadcasting Station on the first floor of the West Wing. FlickrA closer look at FDR’s panel. For the most part, the desk remained the same. When Franklin Delano Roosevelt took office, however, a minor adjustment was made. The Resolute Desk, as it was presented to Hayes, featured two pedestals, each holding three drawers, with another three drawers across the top of the desk and a kneehole underneath. When FDR took office, he requested a hinged front panel be added to cover the kneehole. 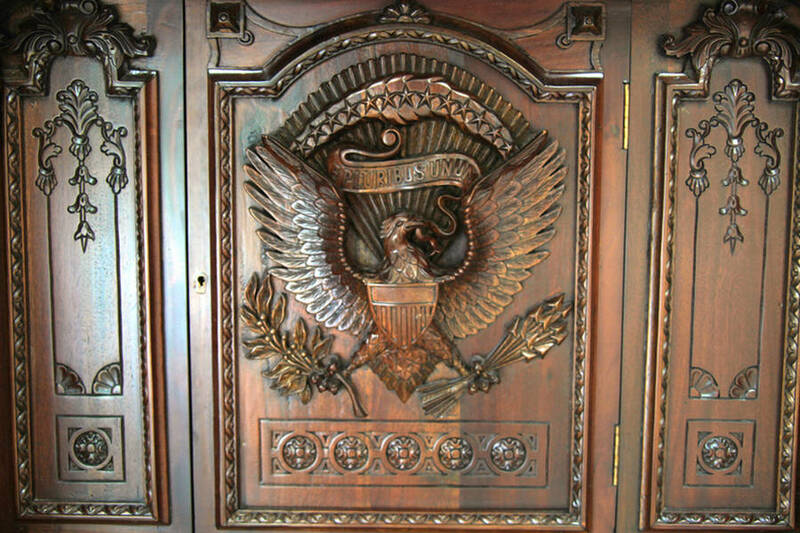 The panel features the presidential seal, though a slightly altered version. It is just one of three seals present in the entire White House that show the eagle’s head facing the arrows in its left talon, rather than the official version which shows the eagle facing the olive branch in its right. FDR, suffering from polio, was notoriously adamant that he never be photographed or seen, if possible, in his leg braces or wheelchair. Though the desk was in his private study and therefore unlikely to be photographed, the president still wanted the panel to hide his leg braces which would have been visible through the kneehole. Unfortunately, he would not live to see the panel be added, though his wishes were granted. 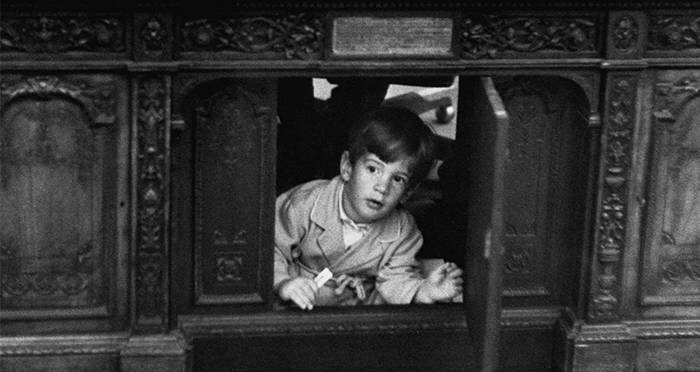 The Resolute Desk’s new facade, including the panel, would become famous after Jacquline Kennedy added it to the Oval Office and a photographer captured John Kennedy Jr. peeking out from behind the panel as his father worked at the desk above him. 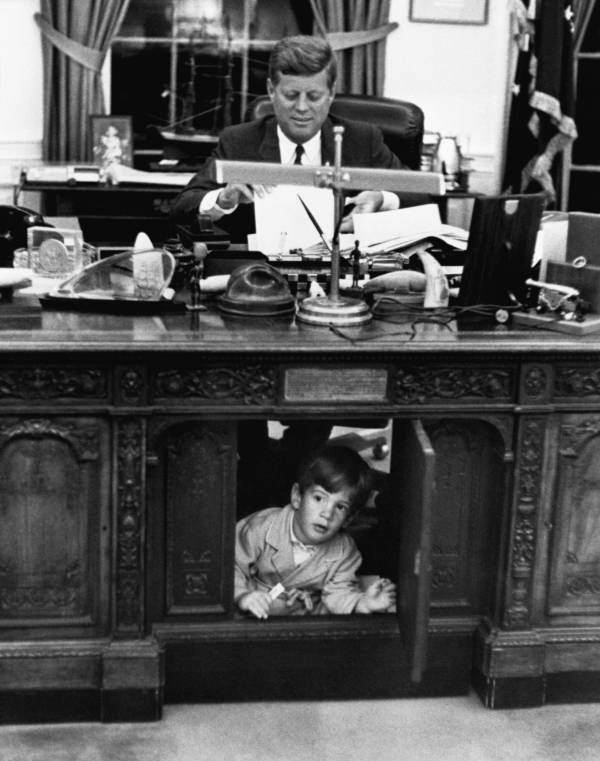 Bettmann/Getty ImagesJohn Kennedy Jr. pokes his head out from underneath the Resolute Desk as his father, President John F. Kennedy works above him. Since the Resolute Desk was gifted to America, only three presidents have declined to use it. The first was President Lyndon B. Johnson. After JFK’s assassination, Johnson allowed the desk to join a traveling exhibition of Kennedy memorabilia, which embarked as a memorial to the fallen president. Rumor has it he was also too tall to fit behind the desk. After the tour, the desk was gifted to the Smithsonian Institution, as yet another testament to JFK. During its time at the Smithsonian, Presidents Richard Nixon and Gerald Ford used the Wilson Desk, a simple, utilitarian, art-deco piece that had rested in Woodrow Wilson’s Oval Office. In 1977, President Jimmy Carter brought the Resolute Desk back to the White House and Oval Office where it remained throughout his and Reagan’s presidencies. President George H.W. Bush moved it to his private study for his term, but in 1993, Bill Clinton moved it back to the Oval Office, where it has remained ever since. In 2009, the British Prime Minister visited President Barack Obama, and brought the original gifting of the Resolute Desk full circle, presenting him with the original commissioning papers for the Resolute. He also brought along an ornamental pen holder made from another ship, the HMS Gannet, which was launched from the same docks where the Resolute was deconstructed. Next, check out these photos of American presidents as young studs. Then, check out these shocking presidential quotes you’ll have to read to believe.